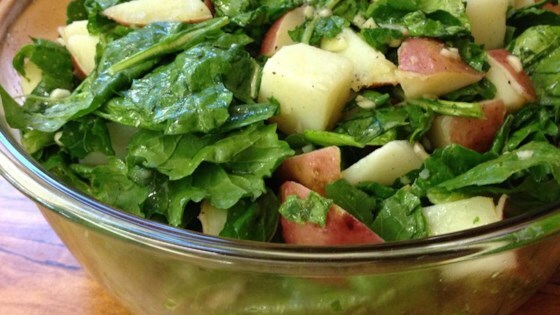 "A different and yummy potato salad; it uses no mayonnaise. This is a nice alternative to use arugula, rather than just adding it to a green salad." I didn't wait for the potatoes to cool, but added the arugula and dressing while still hot. This sort of wilted the arugula and caused the potatoes to soak up the dressing. It was delicious! Not the best thing I've ever made. The consistency was good, but with the bitterness of the arugula and the acidiness of the vinegar, it made my throat burn. This is an easy and delicious salad. We got both potatoes and arugula in our box from our CSA (Community Supported Agriculture) farm. Its a great way to use them together. Yummy, healthy, and easy to make!! I used lemon juice instead of the vinegar, added the arugula to the warm potatoes, and added some feta cheese crumbles at the end. Delish! Huge hit whenever I serve it. I've also made it with lemon juice substituted for the white vinegar, and have found that many prefer it that way.